Ok, we've played around with dimming led's in a previous Arduino UNO tutorial, but the same code can be used to control more powerful components like high power led's and electric motors. The arduino can't provide enough power for these items though and quite often they also run at much higher voltages. Powerful motors often used in robotics may be run at 12, 24 or even 36 volts. This MOSFET is capable of handling a continuous current of 80 Amps (with heatsink of course) and can be easily switched on with only 1V applied to its gate. We can thus switch this MOSFET fully on by connecting on of the Arduino digital output pins directly to the MOSFET gate pin. When switched on fully the MOSFET has a Source to Drain resistance of only 0.0049 ohm. Therefore, if the MOSFET were powering an electric motor at 12V taking 10 Amps the mosfet would only drop 0.049 volts and be using 0.49 watts of power. Important Note: Do not try to run high power motors through the connections on a breadboard. They cannot handle the power and you will burn out the tracks underneath. 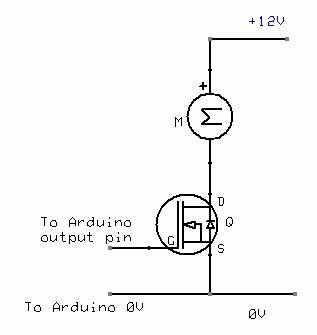 By using the pulse width modulation (PWM) outputs from the Arduino we can control the power (and thus the speed) of the electric motor. Try it out using the sketch from Arduino Tutorial 5 and a 12V car bulb and 12V battery. The 0V line will also need to be connected to one of the 0V connections on the Arduino, but the +12V only goes to the bulb.